Hello and welcome to the first DMX Frid’Eh Update of 2018. Yamaha Motor Canada has been behind Direct Motocross from the beginning so we wanted to thank them for their continued support. Also, #1 for the 2018 season will be none other than Matt Goerke on his Rockstar OTSFF Yamaha. Matt is no stranger to the winner’s circle up here in Canada but this one didn’t come easily. In fact, the final round at RJ’s in Barrie, Ontario, probably took several years off the lives of Matt and his entire team as he battled from the back of the pack to capture his 3rd Canadian title (2012, 2015, 2017). Matt is down in Florida, where he lives, getting ready to make a run at the Rockstar Triple Crown $100 000 first prize in the newly formed Canadian series that will take the riders through Arenacross, Motocross, and finally Supercross. We grabbed him for a talk to get his thoughts on it all. Direct Motocross: Hey, Matt. How are you doing? Matt Goerke: Oh, pretty good. I go back to the doctor next week and hopefully he says I can start riding. Wow, you’re still not back on the bike? Can you tell everyone what happened? Ya, just a first turn crash at that first race in Germany. I guess a handlebar or something just hit me in the wrong place on my arm and broke my ulna. I got a plate put in it. It doesn’t bother me, I feel like I could ride now, but I want to be safe because we’ve got a little bit of time. I think, after next week, he’s going to tell me I can start riding. Let’s talk about your 3rd Canadian championship. How would you rank this one? I mean, they were all awesome, but this one did feel really good. It might have been the best one because I had a lot of competition and going against (Christophe) Pourcel for the championship was tough. He was a good rider. I figured that out right away. I had to work hard to make sure I beat him. It felt great to win this championship. I think it was the best feeling to win this one. And you didn’t make it easy on yourself or your team. That final round at RJ’s was an exciting one! (Laughs) Ya, I know. When I think back on it, there are a few things I could have done differently, and I could have won it a lot easier. I mean, I couldn’t fix the part where my chain derailed. I did a few things throughout the season like fall in the first turn at Gopher (Dunes) and changed my settings for the second moto that I feel like I could have done better, but the last round, I don’t know what happened that first moto. I had that crash and then I got up and panicked, I guess, and then stalled it. Then I had to calm down and just had to catch up. I felt like I rode good the rest of that moto and caught up. The next moto I knew I just needed to get the holeshot to make it easy on myself and I did. I was pumped on that. That last lap battle with Pourcel in Prince George was an exciting one. He beat you by a nobby. Can you take us through that? Ya, I thought I had it. I was just trying to protect my inside lines and there was that lapper in the very last corner which slowed down my speed a little bit and he just had a good line on the outside and carried more momentum down that straightaway. There wasn’t much I really could have done. I guess I should have just tried to pull a way a little more on that last lap, but it just happens. It was crazy. I saw the video and it was pretty crazy how close we were at the finish. It sucked for me at that race but at least I won the championship in the end. Did you know Christophe before or did you speak with him much at the races? No. I knew who he was, obviously, but I didn’t know him. And then at the beginning we were getting along good, battling and stuff, but then at the end, of course, we were both going for a championship, so there was tension, ya know. He seemed all right. At the end, he was trying to get in my head, which didn’t work. I did learn a lot racing against him. I feel like I got smarter as a racer. After that Prince George race, I started thinking a lot more when I was racing against him than I have before because he’s tricky. He’s a tricky rider to race. What did you guys do to celebrate the championship? Did you go anywhere? What did you do? No, we were renting a house down here in Panama City Beach and we had to move out within a month of winning the championship, so we had to find a house to buy. We bought a house just down the road. So we’ve just been working on this house, fixing it up trying to make it nicer. We’re by the beach. We live on the golf course right across the street from the bay. The whole neighbourhood is on the bay. It’s a nice area. You guys have been getting some cold way down there too though, right? Ya, it’s been colder than it’s ever been! The Canadians from my team cam down yesterday, Steve (Simms) and Josh (Cox), and they thought it was warm, kind of. I’m freezing! You mentioned your crash and injury. Can you take us through what happened? Ya, I was feeling good in practice and qualifying. I qualified up front. It was just a first turn pile up. I went to pick up my bike and I felt my arm click and I was like, “Oh crap, I broke my arm.” I just left my bike there and walked away to the paramedics. It could have been worse. I’ve had way worse injuries. At least it was a bone and not the ligaments. So what have you been doing to stay busy? Painting. We’ve decided to paint the entire inside of the house. Man, it takes a lot longer than I expected! I thought we’d get it done in one weekend…we’ve been doing it for like a month! I’ve just been trying to get better and working out. It’s pretty boring. I can’t wait to get back to riding. I made a gym room in the new house. I work out in there right now because it’s so cold. I’ve got an X Bike a row machine in there, a treadmill, and then a bunch of equipment. I’ve just been doing a whole bunch of cardio. 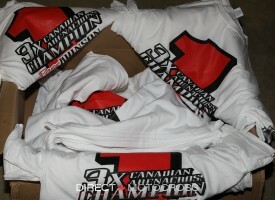 How bummed are you not to be at either A1 or the Amsiol Arenacross this weekend? Ya, I’m pretty bummed to not be at either of them. I’m getting excited just to watch this weekend, but hopefully this Canadian series will be really good. I’ll be pumped when that starts. I have to ask, who’s your pick for the 450 win at A1 this week? I’m gonna go with (Ken) Roczen. I mean, I think (Eli) Tomac might win it, but I wanna see Roczen win it after coming back from that bad injury. It sounds like he’s been working hard to get back to where he was. I think he’s gonna be good. So, your goal for 2018 is the $100 000 Rockstar Triple Crown money, right? What’s next for you? You mentioned the team just got down to Florida. They’re just going to test with Dillan (Epstein) he’s here, too. I’m gonna go out there a little later today and just hang out and watch. They’re gonna test with him and just kind of set my bike up for when I start riding. I’m not sure after that, if I’ll get to test before the first race, but I’ve been riding with the team and Yamaha for long enough and I know what I’m gonna want anyway. What’s your relationship like with Dillan? I just met him last year, but he seems really cool so he should be a good teammate. You guys could be pretty close in speed, so that could get pretty tense as the season goes too! (Laughs) Ya, I know. I know he’s gonna be one of the top competitors, for sure. How old are you now and how many years do you have left in you? I’m 31. And the other day I was thinking about that. I was thinking I’m getting kind of old, but I don’t feel like quitting and I felt good this last summer. I want to do 3 more years after this year, so 4 more years. I think I can do that. I don’t feel like I want to retire at all. I just cringe at the thought of retiring. It’s so boring when you’re not racing. I can go to 35. A lot of guys are still fast at 35. Having this injury made me think about it. I don’t want to retire like most people do at this age. I get anxious sitting around just thinking that I can’t ride. I don’t want to retire…maybe never (Laughs). What would you do after retirement? I’m working on that. I’m trying to start a couple different businesses. I would like to own my own business and do that. I want to keep doing something exciting and taking risks kind of like racing. Maybe I’ll do something like Endurocross, I don’t know. OK, well let’s wrap it up there. Thanks for talking with us today, Matt. Good luck getting back on the bike. Who would you like to thank? Ya, for sure. I’d like to thank Rockstar, OTSFF, Yamaha, Atlas Brace, 100% Goggles, Alpinestars, Fly Racing, Factory Connection, and Pirelli. Hey, one last thing! I saw that video of Cole Thompson hitting that massive double over there at MP County Line. Ya, that thing is big! Everybody always talks about doing it. I said I’m not doing it until someone else does it, but I saw Thompson did it. That was pretty cool. Now you can pressure Dillan to do it. Week #1 is presented by Yamaha Motor Canada. With Yamaha’s Head Office located in Toronto, Yamaha is a truly national company, with a national parts distribution centre, seven product warehouses, a coast-to-coast network of employees, and over 450 dealers. We currently offer hundreds of model variations in nine different product lines. Happy Friday, everyone. Well, it seems to be getting colder and colder here in Southern Ontario. Good news is that things are heating up down South. A1 is finally here. We were teased throughout the off-season with some good racing, but this will be the first time we see everybody on the track at the same time. A lot of questions will be answered, and there are a few big ones. Going into the 2018 season, we will have only 1 former champion lining up in the premier 450 class. That rider is Chad Reed. Can Chad claim another championship?… No! He will be coming in way behind the 8 ball with very limited time on the bike and he will basically be riding himself into shape. He will have to rely on talent and work his way close to the top 5, if possible. So, who is going to be our 2018 champion? That is a great question. We will have a new first-time champion, and we have a few strong candidates. Everyone seems to be on the Eli Tomac bandwagon, and for good reason. He was almost unstoppable at times, but when Eli is off, you have to go way too far back in the standings to find him. That will hurt Eli in the championship hunt. Marvin Musquin would have to be a very close 2nd championship favourite. Marvin was very good last year and he’s been on fire during the off-season races. Marvin just turned 28, and he is now the main guy at Red Bull KTM. He has a lot of weight on his shoulders, but I think he is ready. A lot of people have written off this next guy, and I can see why. I don’t agree, but I see why. Ken Roczen had that horrific crash last season at A2. His arm was destroyed, and in the last 11 months he has endured 11 surgeries, and God only knows how many rehab hours. But he is still Ken Roczen, and if anyone can battle back and win, it is Ken Roczen. Ken is claiming that he is more prepared going into this season than he was in 2017. And we all know how dominant he was before his crash. The 250 West class looks to be very solid going into 2018. We have a defending champion, many riders with multiple wins, and maybe even a few that could battle for their first win. Obviously, reigning and defending champion Justin Hill has to be a favourite. Nothing against Justin, Suzuki, or JGR, but I just don’t see it happening. He is going to be good, very good! But I’m just not positive about the new Suzuki 250 effort by JGR. Yes, they are a top notch team, I just think they need more time on this outdated bike to compete. They will do their best and will win a few, but I just think the title will be going green this year. I’m calling it early, but Adam Cianciarulo will be our West champion. Adam is healthy, and he’s in a really good place, and did I mention that he is healthy? We can count on Martin Davalos to be a heat race killer, Aaron Plessinger will be in the fight a lot as well. I think Shane McElrath will be sneaky good and I wouldn’t be surprised to see him win A1. We can’t forget our boy and lone Canadian Brock Leitner. No, Brock won’t win, he might not even get into the night show, but he has the balls to line up and he is constantly growing and improving as a racer. He is gaining valuable experience, and you can bet this experience will improve his race IQ, his corner speed, and his intensity. 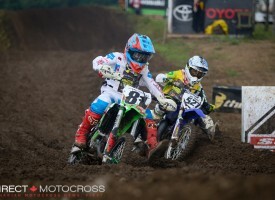 A little closer to home, we have Tanner Ward and Kieran Doherty racing some Amsoil AX this weekend in Dayton, Ohio. This is exciting for both riders. Tanner will be contesting the East series, while Kieran is racing the East in preparation for the West series which is the one that will count for him and his team. Tanner has been pounding the laps down at GPF, and Kieran has been training and living in Arkansas at Lost Creek MX Park . I wouldn’t be shocked to see Tanner lead some laps and hover around the top 5 if he can stay on 2 wheels. Good luck to both, as we will all be cheering you guys on. That is it for me this week. Try and stay warm and stay posted to our social media for all of the latest news. Also, be sure to give this week’s Schrader’s ‘Out of the Blue‘ featuring Fox Canada’s Dominique Daffé a read. Dom is one of the good ones in the sport! Have a great weekend and #smileforBC, #liftwithscott, and #4estrella. Thanks, Jeff. As I sit here typing, the snow continues to fall here in London, Ontario. It looks nice through the front window, but Terry Doherty is picking me up on the way to round 1 of the 2018 Amsoil Arenacross Series in Dayton, Ohio, and the 401 and I-75 can be pretty sketchy in these conditions. My original plan was to hop in the DMX Van first thing Saturday morning to be there for practice and qualifying, but this plan make way more sense, giving us time to spare in case this snowstorm gets any worse. Terry is here early and is giving me the bum’s rush to get on the road. He also said that London is the only place getting snow right now. Figures. Anyway, that’s good news for this upcoming drive. I’ll be posting things on Twitter and Instagram, so be sure to give both a follow and we’ll let you know how are guys are doing all weekend. Brigden,ON – With the recent purchase of CMRC, Motorsport Racing Canada (MRC) is now in the process of developing an innovative racing format intended to ensure the growth of Arenacross, Supercross, and Motocross in Canada. Our vision is to strengthen all aspects of the sport, from amateur development to the top pro teams and sponsors. As one can imagine with a venture of this nature comes some uncertainty as to the final structure. In the past, we have been working with the CMA/FIM as a sanctioning body. This relationship has worked well, however with this developing stage we are now in, the CMA/FIM and Jetwerx have jointly decided to step away from the previous arrangement. As with any relationship both parties have slightly different visions. In order to simplify this developing stage, it has been decided that both parties will work more effectively in separate environments. It is expected that as structures mature both parties will again work together to finalize a strong and homogenous motocross environment across Canada. I gave Kyle Thompson a call to get more information on this and he was quite candid about the whole thing. In the end he said, “There were just too many moving parts” to be able to come to an agreeable end for this year. If they were to be CMA sanctioned, it meant every decision would have to go through the head of the CMA, Marilyn Bastedo. Truth be told, if you were to click on their website, it appears the CMA is still working off a template from 1975 and they really need to get themselves up to date with their website and the way things are being done in 2018. It’s not an insurmountable task, but it is definitely something that needs to be addressed for the two entities to come together in the future. Kyle was quick to point out that the door has been left open, there is no bad blood, and that they will revisit the situation at the end of this coming season. As for the 2018 MXON team, it will still be sanctioned by the CMA and therefore Kourtney Lloyd will go through the CMA just like she did in 2017. Happy New Year to our family of racers, sponsors, volunteers, and supporters from everyone at World Enduro Canada. We are looking forward to another great year of racing in 2018 and once again we will have a full slate of events across Canada to make up our National Cross Country Championship. Last year we enjoyed our best year yet with record turnouts across the country. With the ongoing problem of legal riding areas disappearing, more and more riders are finding these events a great way to get out and enjoy some time on their off road motorcycles. Sept 23 – Rev Limiter – Silver Star Resort – Vernon, BCLooking forward to seeing everyone at the races!! We grabbed Canadian #497 Brock Leitner from BC for a quick chat yesterday as he gets set to line up at A1 tomorrow. Give it a listen and get ready to yell at your TV screens Saturday night. It’s true, Blair Morgan will make his return to the Winter X Games in Aspen, Colorado, in just a few weeks. ‘Superman’ was injured at the Montreal Supercross and has kept a relatively low profile ever since. Fortunately, for his fans, he will line up once again in the Adaptive Snow BikeCross event at Buttermilk Mountain, January 25-28. Steve Simms of Steve Simms Racing (SSR) sent over these photos of the Rockstar OTSFF Yamaha Project 7C bike coming together. Here’s a look at the progress. Blair’s Yamaha is fitted with some trick carbon fibre parts and a Yeti conversion kit. The cockpit of the bike coming together. Jay Burke fitting the roll cage to the bike. Jay is also the guy doing the fabricating and welding. Jay makes sure the positioning feels right. And then puts the finishing touches on the cage. You just know Mike Beaudin wants to be the guy to do the test run. Frame and cage back from Henderson’s Powder Coating and ready for assembly. Direct Motocross will be in Aspen for Blair’s historic return to competition. Thanks for the photos, Steve, and good luck. We’ll keep everyone posted on how this project comes together in the final weeks leading up to the Winter X Games. OK, folks, that’s it for Week #1. Welcome to a New Year. We’re looking forward to getting back at it for another great year. Thank you for making 2017 the best year ever for us here at Direct Motocross. Stay safe, and someone swing by and shovel our driveway while I’m gone, would ya? !